If you have the time, this is a fantastic destination run, providing a sense of Boston History. 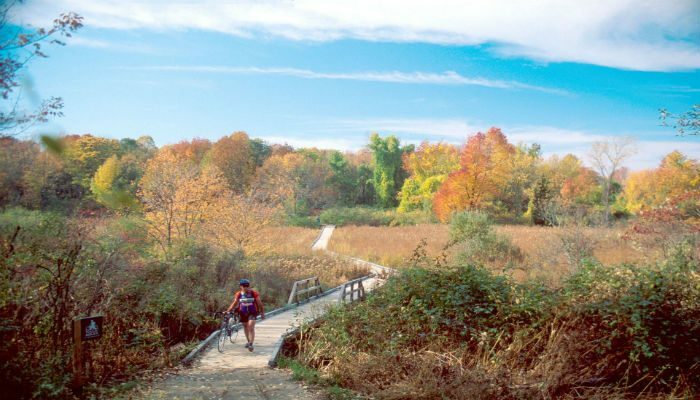 This five mile trail connects historic sites from Meriam’s Corner in Concord to the eastern boundary of Minuteman National Park in Lexington. The main theme of the trail is the Battle of April 19, 1775, that launched the American Revolution. Much of the trail follows original remnants of the Battle Road; other sections leave the historic road to follow the route of the Minute Men, traversing farming fields, wetlands, and forests. This is a dirt trail, all off-road. Click on the park map to see the major sites along the way. Note: Not Maintained in Winter. A great extension is to include Old North Bridge, site of the ‘Shot Heard Round the World’, and a lovely path and hill for jogging. It’s a 5 mile loop from Meriam’s Corner, or a nice 3-mile loop from Concord Center. Concord: Commuter Rail near Concord Ctr.